Funny and Hilarious Dinosaur Jokes for Kids! Joke telling is very fun and can bring a smile to the face of others. Kids love jokes! Jokes can aid in story-telling, create laughs, and help with conversation and social skills. Your child will love this hilarious joke book full of clean jokes about dinosaurs! * BONUS INCLUDED * Reptile and Amphibian Jokes! 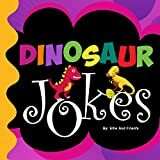 Kids and children can practice their reading and joke telling skills with this funny dinosaur joke book. Beginning and early readers can enjoy hours of fun and entertainment. This book is especially great for traveling, waiting rooms, and reading aloud at home. Q: What would you get if you crossed a dinosaur with a pig? Q: What do you call a dinosaur that keeps you awake at night? 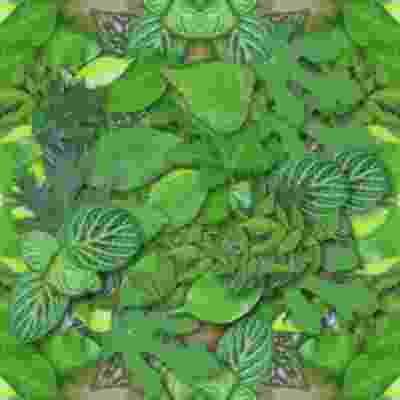 A: Because she was a plant eater! Q: What was the most flexible dinosaur? Q: Why did the dinosaurs eat raw meat? A: They did not know how to cook! Q: How does a snake weigh itself? This funny joke book is full of dinosaur jokes (BONUS - reptile and amphibian jokes) that will have you laughing for hours! This is one of the best joke collections in the world. These jokes dinosaurs, reptiles, and amphibians will have you laughing for hours. These funny jokes are excellent for kids, children, teens, and adults. Early and beginner readers can practice reading aloud and learning. Scroll up and click 'buy' to get this colossal collection! HOW DO DINOSAURS LAUGH OUT LOUD? With good-natured jokes, lift-the-flaps on every spread, and the classic, bestselling characters from Jane Yolen and Mark Teague. 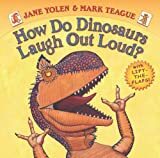 Filled with the beloved prehistoric humor that made How Do Dinosaurs a bestselling series, Jane Yolen and Mark Teague present a new lift-the-flap format to answer the age old question, once and for all, How Do Dinosaurs Laugh Out Loud? Young readers will love to read this uproarious book again and again! Funny & Hilarious Dinosaur Jokes for Kids! Are you looking for a fun book to keep the kids entertained and happy? This funny joke book for kids is excellent for early and beginning readers. Laughing and jokes have been proven to have positive mental and physical effects on the body! The Joke King is back with another hilarious joke book full of funny, laugh-out-loud, crazy comedy and MASSIVE assortment of dinosaur and prehistoric jokes for children of all ages, teens, and adults. This awesome joke book for kids is easy to read and full of laughs! Q: What should you do when a dinosaur sneezes? A: Get out of the way! A: Because the chicken wasn’t invented yet! Q: What dinosaur would you find in a rodeo? Q: What do you get when you cross a bomb and a dinosaur? Your prehistoric friends might not think these jokes are that funny, but you will be rolling on the floor laughing. This awesome collection of dinosaur jokes is one of the funniest collections in the world! These jokes about dinosaurs of all shapes and sizes will make make you go wild with laughter. This joke book is excellent for kids, children, teens, and adults. Johnny B. Laughing is the online comedy king! Scroll up and click 'buy' to get your paws on a copy today! Child Friendly Dinosaur Jokes for Kids! Charlie the Cavalier is a family friendly dog that bring smiles to children’s faces. Charlie brings to you family friendly jokes to make kids and adults smile. Enjoy this book with the children in your life. Amazon Prime Members can borrow this book for FREE! Question: What do you call dinosaur accident? Question: What do you call a sleeping dinosaur? Question: What was the scariest prehistoric animal? Scroll up and click 'buy' to read these funny jokes! For each Charlie the Cavalier and 50 Things to Know book that is sold (not including free days), 10 cents is given to teaching and learning. Go to 50ThingsToKnow.com/GivingBack to find out more. Cute Short Stories and Dinosaur Jokes! Are you looking for a children's book that is highly entertaining, great for beginning readers, and is jam-packed with stories, jokes, and more? Follow the adventures of Spike the Dinosaur! This is an excellent read for early and beginning readers. Each story is full of adventure and excitement with cute and bright illustrations for younger readers. This book is especially great for traveling, waiting rooms, and reading aloud at home or school.